With the AVS Photo Editor application you can easily find the needed folder, edit your photos the way you want using different tools, changing color and tone settings or selecting one of the available ready presets and finally save the image you have just edited into one of the supported image formats. It offers everything for you to excite your fantasy, achieve the best results and simply enjoy the process. print the edited photos after setting the paper format, their size and position on a sheet. 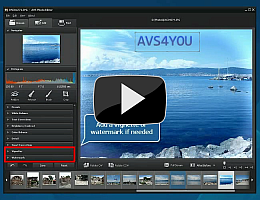 To launch AVS Photo Editor open the Start menu and select All Programs -> AVS4YOU -> Image -> AVS Photo Editor. How to make a black-and-white photo from a color one? What is in AVS Photo Editor?